Part of what makes Takedown Eventures so unique is the incredible team we’ve been able to assemble. Our “guides” reflect a perfect balance of professionalism from both a business and outdoorsmen standpoint. The team includes business owners, supervisors and elite athletes that all have a passion for the outdoors. Most are highly esteemed in the outdoor community with some having appeared on TV for their hunting adventures. Every one of our guides are charismatic leaders that possess a high level of relational intelligence and humility. Your guests are safe with us! We pride ourselves in guaranteeing that our clients should never have to worry about ANYTHING throughout the day other than interacting with their guests. 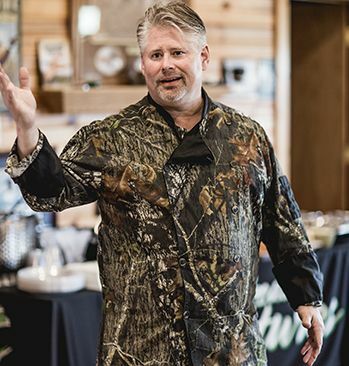 Our team would not be complete without the entertaining presence and exquisite meal presentation of Chef Chris Barth, owner of Retro Bistro in Mount Prospect and Crystal Lake, Illinois. Chris has received many awards and accolades including being featured on PBS network’s Check Please and ABC Local’s In The Kitchen. Retro Bistro has also been recognized by top food critics from the Chicago Tribune and Daily Herald.